Jump starting Jump starting can be dangerous if done incorrectly. Therefore, to avoid harm to yourself or damage to your vehicle or battery, follow the jump starting procedures listed on page 6-6. If in doubt, we strongly recommend that you have a competent technician or towing service jump start your vehicle. NOTICE Use only a 12-volt jumper system. You can damage a 12-volt starting motor, ignition system, and other electrical parts beyond repair by use of a 24-volt power supply (either two 12-volt batteries in series or a 24- volt motor generator set). WARNING - Battery Never attempt to check the electrolyte level of the battery as this may cause the battery to rupture or explode causing serious injury. WARNING - Battery • Keep all flames or sparks away from the battery.The battery produces hydrogen gas which may explode if exposed to flame or sparks. • Do not attempt to jump start the vehicle if the discharged battery is frozen or if the electrolyte level is low; the battery may rupture or explode. Jump starting procedure 1. Make sure the booster battery is 12-volt and that its negative terminal is grounded. 2. If the booster battery is in another vehicle, do not allow the vehicles to touch. 3. Turn off all unnecessary electrical loads. 4. 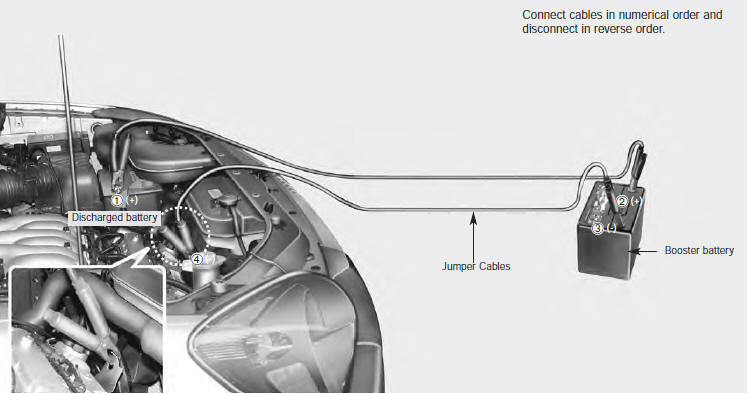 Connect the jumper cables in the exact sequence shown in the previous illustration. First connect one end of a jumper cable to the positive terminal of the discharged battery (➀), then connect the other end to the positive terminal on the booster battery (➁). Proceed to connect one end of the other jumper cable to the negative terminal of the booster battery (➂), then the other end to a solid, stationary, metallic point (for example, the engine lifting bracket) away from the battery (➃). Do not connect it to or near any part that moves when the engine is cranked. CAUTION - Battery cables Do not connect the jumper cable from the negative terminal of the booster battery to the negative terminal of the discharged battery. This can cause the discharged battery to overheat and crack, releasing battery acid. Do not allow the jumper cables to contact anything except the correct battery terminals or the correct ground. Do not lean over the battery when making connections. 5. Start the engine of the vehicle with the booster battery and let it run at 2,000 rpm, then start the engine of the vehicle with the discharged battery. If the cause of your battery discharging is not apparent, you should have your vehicle checked by an Authorized Kia Dealer. Refer to illustration on page 6-5. Push-starting Your manual transaxle-equipped vehicle should not be push-started because it might damage the emission control system. Vehicles equipped with automatic transaxle cannot be push-started. Follow the directions in this section for jump-starting. CAUTION Never tow a vehicle to start it because the sudden surge forward when the engine starts could cause a collision with the tow vehicle.